As the 2012 elections approach, several new studies by civil rights advocates are fueling the controversy over voter identification laws. One study, released by the Black Youth Project, predicts major negative effects of such laws on American minority populations, especially younger eligible voters (ages 18–29). As many as 700,000 people of color may be prevented or deterred from voting, the study’s authors claim. They say that recent laws that require stricter identification of voters at the polls, such as by photo IDs, will disproportionately impact people of color because they are less likely to have the necessary IDs or other official paperwork, which can be costly to get. Latinos and African Americans already have lower levels of voter registration than non-Hispanic whites, and minorities more often lack photo identification. Presenting proof of citizenship, which some Voter ID laws require, is another problem for some individuals of voting age. 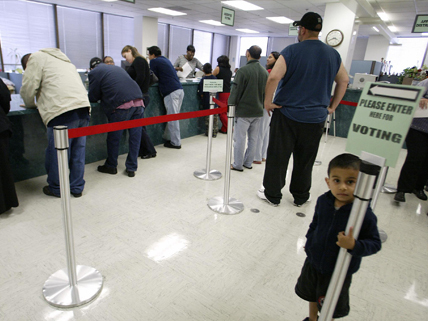 The states’ various voter identification laws differ in terms of strictness. Most include a procedure for a voter unable to satisfy the requirements at the polling place to cast a “provisional” ballot, which may or may not end up being counted, depending on whether the necessary identification is presented soon after the election. According to supporters of voter identification laws, which are in place in 31 states, their purpose is simply to combat voter fraud. In some states, efforts are also under way to clear, or purge, voter registration rolls of names that do not qualify. According to a report by the Pew Center on the States, 1.8 million deceased persons are currently listed as registered voters. In addition, millions of registrations are inaccurate or invalid—mostly due to Americans’ mobility. The extent of actual voter fraud is difficult to prove, according to one professor of law and political science who also says that it is equally difficult to find someone who can prove he or she was prevented from voting by the ID requirements. And one area that is ripe for fraud—absentee balloting—is not being reformed by these laws. This article by a nonprofit group promoting “journalism in the public interest” examines the issues surrounding voter identification laws. Read about the Black Youth Project study critical of strict Voter ID laws for their likely negative effect on electoral participation among youth, especially minorities. This article recounts the claims by the Advancement Project that strict Voter ID laws will have a huge discriminatory effect on Latino voting participation. Get all the facts on Voter ID laws across the 50 states, including details of differing requirements and status of legal challenges; includes an interactive state-by-state map. This opinion essay by a professor of law and political science questions the ability of Voter ID laws to address the underlying, largely unproven problems. This article covers the report by the Pew Center on the States about voter registration lists nationwide. Maybe Gov. Perry called the sciaepl election for the day of the regular election so that the write in candidate would be on the ballot so that all the Republicans will know who the write-in candidate is supposed to be.I mean, that’s a possibility, right?Love the blog, by the way. Visit just about every day, even though I usually don’t comment. Hardly voter suppression. It is voting integrity. ID is mandatory for so much more than voting and I hear no complaints. It hurts America NOT to have voter ID. If a family member cannot help another family member obtain ID, the desire to vote is not really there, but the desire to yell discrimination and complain is there. I am sure if a person had to obtain ID to win a million dollar lottery someone would find a way to obtain the proper ID.If voting is as valuable to a person as a lottery win, the same ‘drive’ to get an ID would be present. What i do not understood is in fact how you’re now not really much more smartly-preferred than you may be right now. You’re very intelligent. You recognize thus considerably on the subject of this matter, made me individually imagine it from so many numerous angles. Its like women and men aren’t fascinated until it’s something to accomplish with Girl gaga! Your personal stuffs nice. Always take care of it up! Good way of describing, and good paragraph to obtain information on the topic of my presentation topic, which i am going to convey in school. I think this article is very useful if you want to talk about stuff that happened in 2012 i want to here more about 2014 or even 2013. I like this article but it would be helpful to have some info on stuff right now.